Hippie Chick Design: Bead Hoarders Reveal Time! 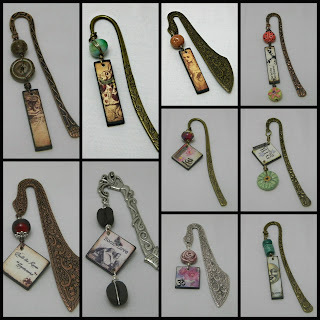 Several weeks ago I signed up to participate in Lori Anderson's Bead Hoarders Blog Hop. At the time I signed up I didn't realize I would be at an all day show on reveal day...needless to say I'll be hopping late this evening or Sunday while I sit around in my pjs recouping from the show! For those who don't know this hop is about using beads from our own stash to create...whether you hoard, stash, or save for "just the right design" the idea is use those fabulous goodies! Previously I have shared pictures of my ever growing bead addiction...some artisan goodies I just can't resist and I won't even bother to try! Participating this hop has been wonderful. I created lots of new designs...perfect timing for my show...and after I return from the show I will be having shop update which is long over due! I have tons of fabulous images from Calico Collage, and a bit of serendipity revealed how perfect the matchstick (half domino) size works for bookmarks. From past designs I knew the images would be beautiful with Gaea's beads, Firelily boro beads, and Spirited Earth beads. Similar wood tiles are available in my supply shop, Asbury Avenue Designs. The matchstick tiles are also a great size for long, lightweight earrings! Again, I've combined the images with Gaea and Firelily beads. The tiles are also beautiful wrapped in filigree as seen in the last pair. 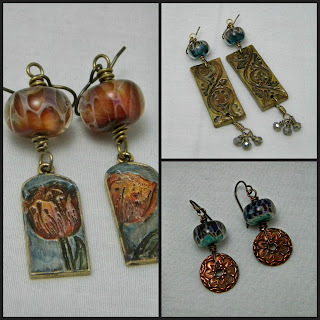 The earrings on the right are my first attempts at using Ranger patinas from Vintaj to color the brass chandelier drops. They are fun and easy to use...I have many ideas for future designs with colored metals. The gorgeous glass headpins are from Havana Beads. I love the way these earrings turned out! Everything just really came together in creating these beauties. The first pair has charms from Tesori Trovati and boro beads from Firelily. Erin offers 3-6-9-12 month samplers and I was most fortunate to "subscribe" for almost a year in 3 and 6 month increments. These charms were from one the samplers making them an extra special treat because she only creates so many of each month. 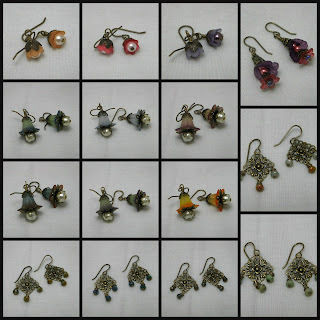 The top right earrings are Firelily beads...are you seeing a pattern here...lol! They are paired with long rectangles from Menagerie Studio, finished off with a few sparkly crystal dangles. The last pair has copper charms from Kristi Bowman Design. These I have held onto waiting for "just the right beads" and I think these boros from Firelily turned out to be perfect! The purple in the beads really picks up the purple in the copper. Thanks to a custom request I even got creative with some filigree, Czech firepolish, Lucite flowers and colored glass pearls. I have a huge variety of colors and sizes in the flowers and filigree so keep an eye out during the shop update for some new collections made from these! Last but not least, I did manage to create several necklaces too! Some of these were projects started that didn't work out in the first go around so I set them aside...some were in the planning stages but never progressed past planning. I am very pleased how they all came together, sometimes creating is all about timing! 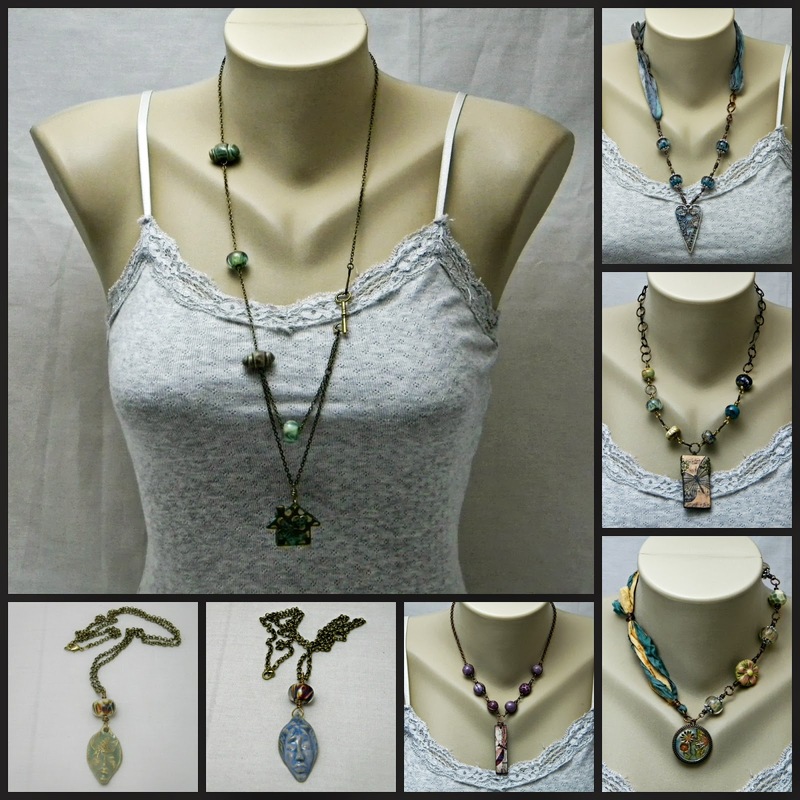 These designs range from extra long to choker style and share some of my favorite artists. 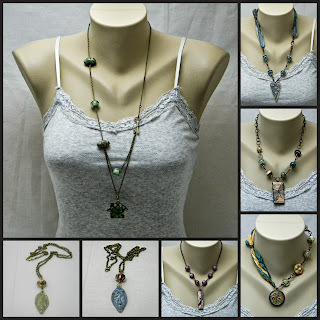 Menagerie Studio, Firelily, Tesori Trovati, Spirited Earth, Bo Hulley Beads﻿, Gaea and images from Calico Collage. I would like to thank Lori for hosting this hop...it has been wonderful for my creative flow! I'd also like to ask you all to send a little extra love, good thoughts, prayers, whatever Lori's way...she's had a lot of health struggles over the last few months and I know our support and caring helps her so much. Also, a big THANK YOU to all the wonderful artists who do what they do that helps inspire me to do what I do...I appreciate each of your friendships, creativity and inspiration so much! These all look great! <3 You really out did yourself!! What gorgeous designs. You have been busy. Great job. Boy, you got a lot done! Everything really looks great! Just love the sampling. Adorable and I would just love to play with your stash......I enjoy working with the Ranger patina's too. Thanks for the inspiration. I really like the way you combined your elements to make thoughtful and delightfully composed pieces. Well done! You've really been busy! Great designs. 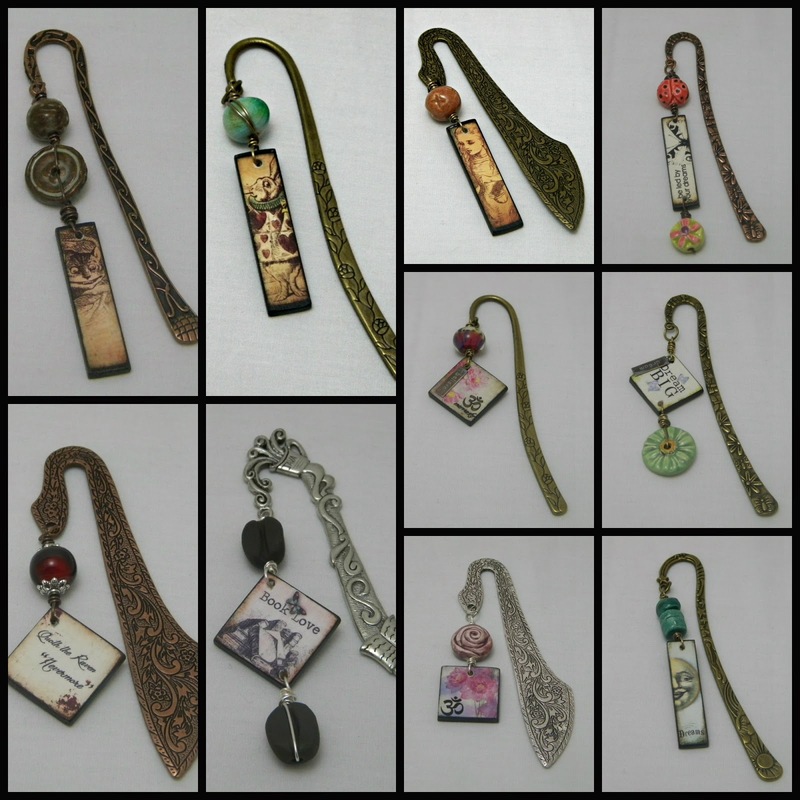 What a huge collection of beautiful designed jewellery and bookmarks. It's hard to choose a favourite. Maybe it's the pair of earrings with the tulips♥, yes that's the one! Oh My you have really made some real lovelies here!! I think you had the elves help you?! LOL Wonderfulness! Blimey you have been super busy! Such beautiful makes. Think my faves are the delicate flower drop earrings. Just lovely. Wow, Kari, you really went to town... great variety of beautiful designs! What a great group. You really outdid yourself. Awesome work as usual! Thanks for the post! Fabulous, you have made some fantastic pieces! Oh my You have been creative !! Wonderful variety of supply used in a gorgeous way ! Wow! You sure were busy. Wonderful and unique pieces. HOLY MOLY! You must have hands that work at the speed of light! :) Fantastic! You made so many lovely pieces! Do you ever sleep? I have some matchsticks coming to me soon, and after seeing your wonderful bookmarks, they won't be sitting and waiting long to be used! Everything is wonderful. Wow you were a busy little beader, beautiful work! Wow, you created so much! Everything is so pretty! That is an amazing amount of jewelry. Great job using so much of your stash. Your designs are beautiful. Great designs all! You were certainly busy in cleaning out some of your stash. My favorites have the be with the Firelily glass and the Tesori Trovati charms. I just adore Erin's work and I have going to have to check out Firelily. I loved every single one of your designs .Beautiful. 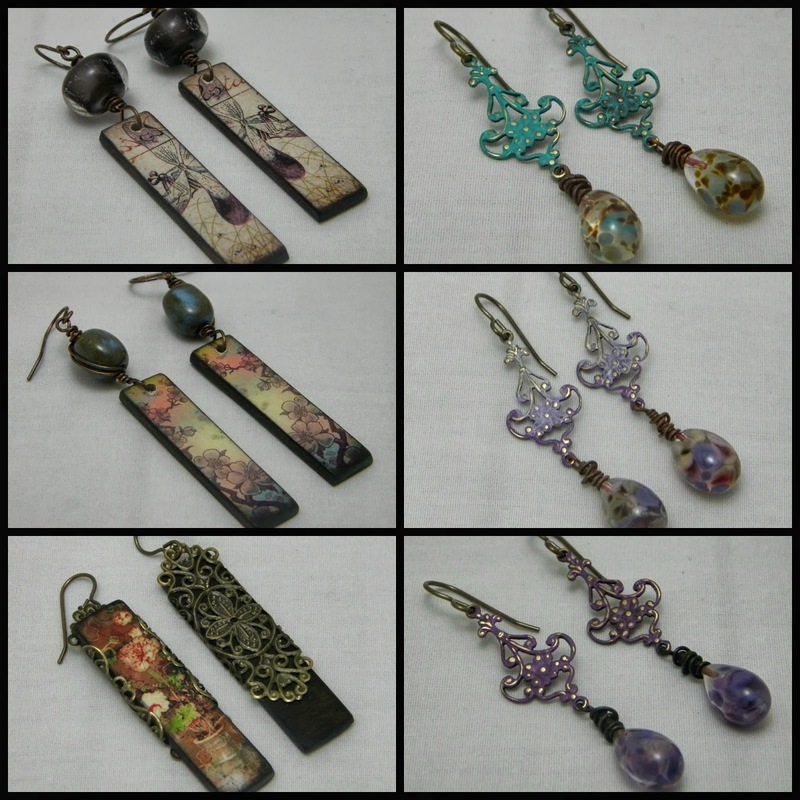 You made so many beautiful pieces, both the bookmarks and earrings! 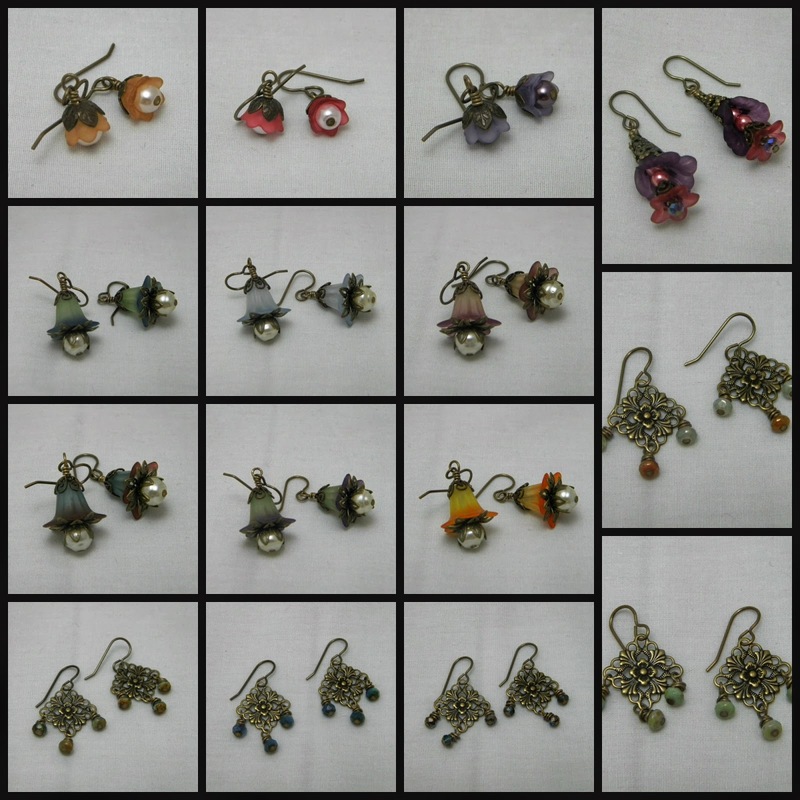 My favorites are the earrings using the Firelily beads. I will have to check them out, and the Kristi Bowman designs. Thank you for visiting my blog and your kind comments! I'm finally getting some blog hopping done! :) What a wonderful array of pieces. I have bookmarked your page so I can come back to it & browse your blog. Fabulous!